WebGoonies.com - Back to potty training.. Written on April 17, 2007 by Kevin. It has been a while since we attempted the potty training with Rylan. We were at Target nearly a month ago looking for a potty to purchase when he fell and required stitches. We put training on hold while he recovered and still had to manage finding the potty that we were looking for. We never did find exactly what we were looking for so we went on Target.com and found the BABYBJORN Little Potty. It was exactly the style of potty we were looking for. 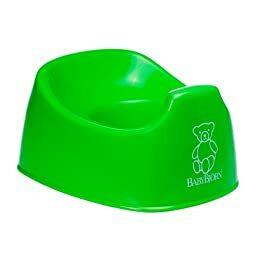 We had purchased Rylan another basic potty at Walmart but we quickly found out that he wanted to use it as a toy rather than a potty. We took it back and went on a hunt. This new potty is all one piece sturdy hard plastic that does one job without all of the fun. It is common for Super Nanny to recommend not purchasing a potty with a lot of bells and whistles because it may turn into fun time. We stayed clear of this entirely. There is nothing to do with this potty except to do your business. After waiting what seemed like forever, the potties arrived yesterday. We picked up 2 identical green ones so that we can use one at the grandparents houses without too much confusion. Rylan was excited when the UPS guy pulled up and he seemed to know that the packages were for him. I cut into the box and let Rylan take his first look at what will now be his little throne. He was in awe. Without delay, we went ahead and took his diaper off and he immediately went to sit down. He positioned himself as we watched waiting for his first usage. We waited, and waited. He wasn't going for it. After letting him walking around a bit without his diaper, he positioned himself on the couch while watching television. Hmm, a noise. The noise of a peeing little boy. Yes, he peed on our couch instead. It looks like he was a bit gun shy when it came to sitting on the potty itself so he decided to pee when no one was looking. We aren't going to push this training too much and instead during the day have him in a diaper and when I get home, let him attempt to use the potty until he has used it. This way it should minimize the possibility of accidents that my uber-pregnant wife would need to clean up. We picked this potty to feature on the potty training segment we are filming next week for our site. We'll also talk about the Baby Bjorn toilet insert that I'm using to train my youngest right now. One of the great things about inserts -- he managed to pee a steady stream neatly between insert/seat and commode. Our segment should hit the site in about 10 days. We'd love your thoughts.